U-591 left St. Nazaire 26 June 1943. In addition to the standard complement of officers, Oberleutnant (Ing.) Schubert was taken along to instruct Leutnant (Ing.) Pipal, whose experience in the duties of an engineer officer on board a U-boat had apparently been limited. As protection against aircraft attacks in the Bay of Biscay, five boats left together from St. Nazaire. They were U-591, U-604 commanded by Kapitänleutnant Holtring, U-598 commanded by Kapitänleutnant Holtorf, U-662 under Kapitänleutnant Heinz Eberhard Muller, and a U-boat commanded by Kapitänleutnant Dietrich. Three days after leaving St. Nazaire, the boat commanded by Kapitänleutnant Dietrich was reported to have returned to her base due to engine trouble. 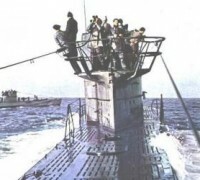 The other four boats were said to have met a supply U-boat, U-487 under the command of Oberleutnant d.R. Metz, during the early days of July 1943, when in approximate position 41º 00" N., 14º 00" W. The U-boats just topped up with fuel oil, each receiving only about 30 cubic meters. Kapitänleutnant von Buchholtz. Leutnant (Ing.) Pipal now took over all the duties of the engineer officer on board U-591. Continuing a few days longer on her original course of about 2400 T, during which time U-591 and U-598 kept in visual contact, U-591 changed course to about 2100 T when at 39º 00" N., 17º 00' 30'' W. Her speed after the meeting with U-487, was her most economical, as she was not going to be supplied again until the completion of her patrol activities on the Brazilian coast. In approximate position 28º 00" N., 250 W. course was changed to about 2000 T. The trip towards the bulge of Brazil was uneventful. Several trial dives were undertaken, but otherwise the enjoyment of the passage was undisturbed. On 22 July 1943, U-591 sighted a patrolling aircraft and the order to dive was given immediately. Shortly thereafter explosions of bombs were heard, but except for the temporary failure of some light switches no damage was done. 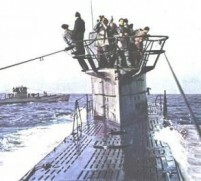 U-591 surfaced soon after, but again fond herself the target of a second attack, which she again eluded by crash diving. CHANGE IN COURSE -- ARRIVAL IN OPERATIONAL AREA. After the attack, U-591 steered a southerly course, then changed to course 2700 T at about 080 S. She had arrived at her operational area and was ready to intercept any traffic that might be moving through the area assigned to her.